The SSE Hydro opened in Sep 2013 with a four night run of Rod Stewart. The venues hosts music, comedy, theatre and sporting events, with previous performers including Beyonce, Justin Timberlake, Andre Rieu and Fleetwood Mac as well as Top Gear Live, Dancing on Ice and Harlem Globetrotters. The building has won several awards for its design including the Architectural Excellence Award (Public Building) at The Scottish Property Awards 2014. 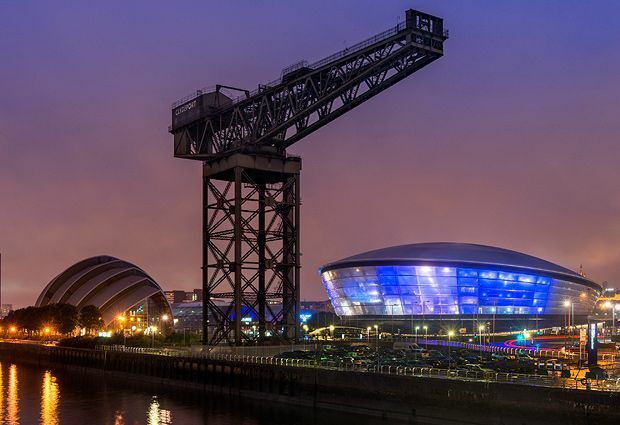 The Hydro is approximately one mile from Glasgow city centre with a multi-storey car park adjacent to the venue. The Exhibition Centre railway station is a short walk from the SSE Hydro, with trains six times an hour from Glasgow Central. Joint tour from 80s favourites Sister Sledge, Jason Donovan, The Fizz, Five Star, Martika, Hue & Cry and Living In A Box featuring Kenny Thomas. A unique voice mixing opera and classical with pop. The pop songstress tours her latest album Sweetener. Probably the best known and certainly one of the longest running Floyd tributes, supposedly counting members of the real band among its fans. Country star sensation tours in support of her new record Cry Pretty. The mononymous singer and actress. Find out if she's still a 'Maneater' as Daryl Hall and John Oates rejoin forces to take their well-loved back catalogue and new tunes on the road. The hilarious tale of Buddy, a human raised by elves after he is unknowingly transported back to the North Pole with Santa, who ventures to New York City to find his long-lost father. Starring David Essex as Buddy's father, Tam Ryan as Buddy and Martine McCutcheon as Jovie. The highly acclaimed Royal Philharmonic Concert Orchestra perform The King's most iconic and beloved pop and blues-rock hits to accompany archive recordings and an on-screen video of the man himself. With With the The Royal Philharmonic Concert Orchestra. Wu-Tang Clan, Public Enemy and De La Soul come together for a UK tour. With Wu-Tang Clan, Public Enemy and De La Soul. Hugh Jackman brings his new one-man show to the UK, where he covers songs from The Greatest Showman, Les Miserables and Broadway hits. The English comedian returns to UK arenas. Grammy nominated American singer-songwriter performing R&B and pop hits from his latest album Free Spirit. Indie music from the Glaswegian singer-songwriter and musician. Pop with an R&B twist from the first girl group to win the X-Factor, back in 2011. Colorado roots rock trio with a bit of the Mumfords about them. Geordie bandana-fan and frontman of 80s stadium greats Dire Straits returns to the city of his birth for a concert of his more folk- and country-influenced solo material. All your favourite superheroes come to life in this action packed, stunt-filled arena spectacular that sees The Avengers, X-Men and Spider-Man team up to defeat the worst villains in the Marvel Universe. A big celebration of Scottish music and dance featuring over 200 pipers, drummers, dancers, musicians and vocalists. British pop R&B diva who has scored some huge hits with RIP and How We Do (Party). Gravel-voiced Rod returns for more onstage shenanigans lapped up by a partying crowd. There's always 'Maggie May' to look forward to. This time round he is promoting his latest studio album Blood Red Roses. The award-winning comedian sets off on a new worldwide tour. The Jamaican recording artist and musician - born Sean Paul Ryan Francis Henrique - performs his Grammy award-winning brand of hip hop. The ultimate 90s concert, featuring performances from Peter Andre, 5ive, S Club, BoyzLife, B*Witched, Blazin’ Squad, Booty Luv, Big Brovaz and East 17. The stage version of Ford Kiernan and Greg Hemphill's TV sitcom of ageing disgracefully, starring Ford Kiernan as Jack Jarvis and Greg Hemphill as Victor McDade. A screening of Tim Burton and Henry Selick's classic animated film with live accompaniment featuring Danny Elfman as Jack Skellington, Catherine O'Hara as Sally, and Ken Page as Oogie Boogie. With Danny Elfman, Catherine O'Hara and Ken Page performing live. Over a dozen pop acts from the 1990s unite for a UK tour of retro music. With Jenny Berggren from Ace of Base, Vengaboys, 2 Unlimited, SNAP!, Whigfield, Haddaway, Dr. Alban, Culture Beat, C+C Music Factory, Cappella, Rednex, DJ Sash!, Robin S., La Bouche and Alice DJ. Nicky Byrne, Kian Egan, Mark Feehily and Shane Filan are back with brand new music and a 2019 tour. Catch the pop sensations live next summer including a show at London's O2 Arena.